ROME, Italy (CNN) -- World leaders have made "extraordinary" commitments to short-term food crisis solutions but more work is needed on long-term solutions, the head of the United Nations food agency said Thursday. 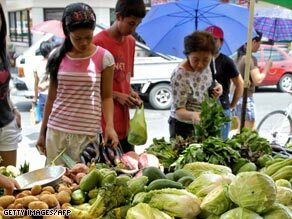 Food prices in the Philippines are soaring. Countries and delegations pledged more than $1 billion in food aid to meet emergency needs, said Josette Sheeran, executive director of the World Food Programme. She was speaking at the end of a three-day U.N.-organized summit in Rome, Italy, to tackle the global food crisis. "We put out the call to the world and they responded in an extraordinary way," she said. "This is important to people who do not have enough to eat right now and the next meal." Delegates agreed to invest more in agriculture -- such as providing small farmers in poor countries with fertilizers, seeds, and farm equipment -- with the goal of increasing worldwide food production by 50 percent by 2030. The financial and food assistance and the support for agriculture are the two immediate, short-term goals outlined in a widely circulated draft declaration obtained by CNN. Officials said the two steps are needed as a quick fix, but they urged countries to think about solutions for many years to come. "This requires re-engagement in the agricultural sector for the longer-term," said Lennart Bage, president of the International Fund for Agricultural Development. "We have to feed a growing population, and hopefully growing affluence and less poverty, and that means 50 percent more production in 20 years' time." But long-term plans to address hunger, low food production, and high food prices were left open to further discussions. Delegates left Rome without consensus on key issues such as the increased demand for crops to produce biofuels and the impact on world food prices, and there is also no agreement on the lifting of trade barriers and the issue of farm subsidies, officials said. "As long as you have subsidies from rich countries combined with a free trade agenda in developing countries -- which means the poor countries open up to rich ones -- their farmers can't compete with subsidized goods coming in from Europe and the U.S.," said Alexander Woollcombe, a spokesman for Oxfam. "When prices go up, as they are at the moment, that means people in these countries cannot afford food." The summit was not supposed to produce a deal or a worldwide agreement on tackling hunger. Rather, it was intended to come up with recommendations and solutions that countries and international organizations could implement. The medium- and long-term measures outlined in the draft document call for investment in agriculture and agricultural science and technology. They also say the world's food production systems must be made resilient to climate change. Governments need to find ways of helping small, independent farmers and fishers adapt to climate change, such as giving them money and investment for new technology, the draft said. Liberalizing trade was another key long-term theme at the conference. The draft says countries must reduce trade barriers and "market-distorting policies" to help farmers -- particularly those in developing countries -- sell their products and increase production. Finally, the draft calls for more studies into biofuels to make sure they are sustainable, amid concerns that biofuels take too much food away from supermarket shelves and dinner tables. U.N. Secretary-General Ban Ki-Moon said Wednesday that as much as $20 billion a year will be needed to build up resources to address the food crisis. The World Food Programme said Wednesday it has given an extra $1.2 billion in aid to 62 countries hardest hit by the global food crisis. The U.N. agency is already providing some $5 billion to 90 million people in 78 countries this year. French President Nicolas Sarkozy pledged more than $1.5 billion over the next five years to boost agricultural productivity in Africa, Ban said Wednesday. Saudi Arabia announced it is giving around $500 million to the World Food Programme to deal with the emergency in the short term, and the United States has committed some $5 billion over the next two years, much of it to help find long-term solutions.